Update: Gapps for arm and arm64 now available for download. When it comes to flashing a custom ROM, GApps, short for Google apps, are very important. A custom ROM such as LineageOS, Resurrection Remix, Paranoid Android, etc. usually doesn’t come with Google apps. There are multiple reasons for that. If it were the contrary, then there would be multiple builds of the same ROM and the build would become heavy. Plus many users get a choice of not to use Gapps with their new ROM and keep it free from Bloatware. 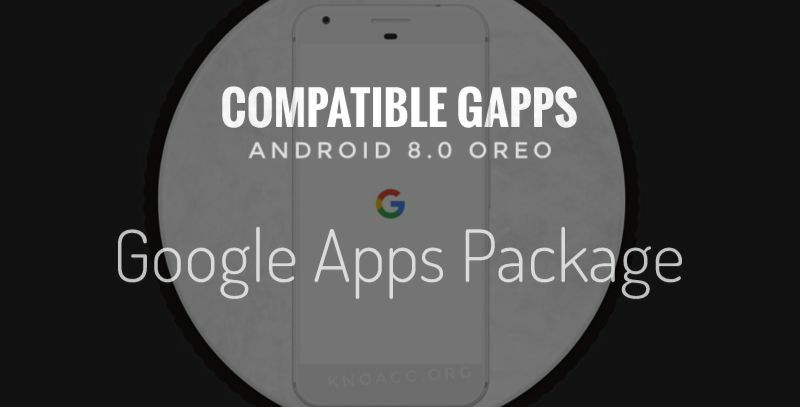 Earlier, we have listed Gapps for all the Android version be it Nougat, Marshmallow, Lollipop, KitKat, etc. Recently, Google released official Android 8.0 Oreo update for some of the stunning Pixel and Nexus series phones. Here, download the Google Apps or Gapps for Android 8.0 Oreo. Gapps are as essential part of the Android operating system. This way, you have all the Google Play services including the official Play Store. It comes for all the devices and all the processor architecture including arm, arm64, x86. So once the Lineage OS 15 is released based on Android 8.0 Oreo, you will need the latest Gapps to run all the Google services. At this moment, Gapps for all the processor architectures have not been developed. Only arm Gapps are available. This is because the AOSP 8.0 Oreo sources are very new and deploying custom ROMS and Google apps for different apps takes a little time. However, you can still flash them on your phone regardless its arm or arm64. Before you do that, boot your phone once immediately after you flash your Android 8.0 Oreo based custom ROM. Read: How to find processor architecture arm, arm65, or x86? The open gapps are quite popular and trust worthy when it come to custom ROMS. They are compatible with almost all the custom ROMS such as LineageOS, CyanogenMod, RR, AOSPA, etc. The following are unofficial open gapps builds. This is because the development has just begun. We will publish official Open Gapps for Android 8.0 Oreo once available. Make sure to use the Gapps on custom ROMS only. Stock firmware from manufacturers come with Google apps inbuilt. Except if it’s a Chinese firmware such as MIUI9 China developer ROM or HydrogenOS. SImply download the package and flash via TWRP recovery after flashing the Android 8.0 Oreo firmware file. The latest Google Play Services builds for 8.0 Oreo have been deployed by Google. Download the latest Google Play services 11.5.30 (948-166270645) beta APK from below. Full downloads repository for Google Play Services . Install as normal APK file after your Oreo ROM has booted up. You will also need the Google Play Store APK to download apps.